There are several things that set this Italian artisan collection apart from the masses. One, the design. Typically crystal-embellished hoops are pavé set, meaning the individual stones are set into the metal. This is pretty, but it’s not the same as the stunning effect of continuous sparkle that’s uninterrupted by the setting. In the Doppio Cerchio Collection the Swarovski® crystals are showcased in their entirety atop the metal. The result is absolutely more sparkle for your buck. The second thing that sets this collection apart is the price. Big name designers tack on another zero for this look. We refuse to give our customers the runaround and overprice jewelry just to tout a big name. 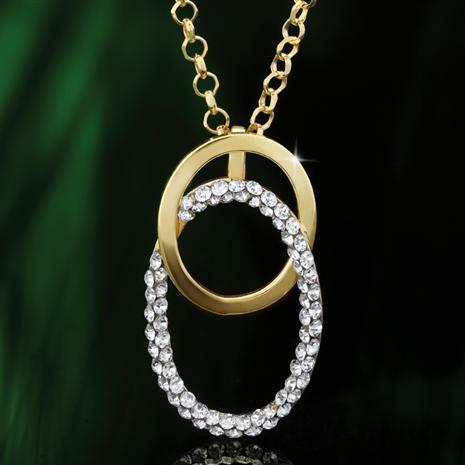 That’s why you can bring home Italian-designed gold jewelry without jumping through any hoops.